Last time I looked at transit costs I was paying something like 60pence/Mbps, admittedly only for a 1Meg commit. My habit of sharing blog posts on Facebook seems to be attracting an eclectic bunch of ads and this morning I was pushed one from Hurricane Electric for transit pricing! 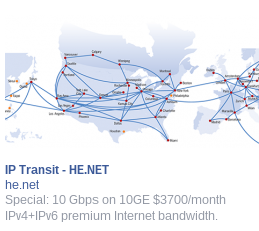 This pricing, which is being touted as a special offer at $3,700 a month for 10Gbps. That’s 37 cents a Meg or about 25 pence according to Google. Much cheaper than I was paying a couple or three years ago. However nota benne the LONAP 10Gig port price which is currently £375 a month for the first with subsequent ports a rock bottom £300 a month. That’s less than four pence a Meg. Even cheaper if you have more than one port. Now it makes sense to have a blend of transit and peering, particularly as you can’t access all routes via peering but you can see how it makes real sense from a cost perspective to bias your network towards the latter. And it’s not just pricing. Using a peering exchange such as LONAP also makes technical sense as you get better adjacency – fewer router hops on average between you and your destination. Lower latency connections. The pricing in this post is relevant now but one thing is certain and that it has further to go down. We continue to be in boom times in the internet networking game and there is no sign of it letting up. 10Gig ports on the exchange have long since replaced 1Gig as the bread and butter and the world is only waiting for 100Gig to become cost effective before moving en masse. Currently the main cost benefit in moving to 100Gig is that you need fewer wavelengths. ie fewer fibre strands which makes it more manageable physically. Otherwise 100Gig kit costs 10 x 10Gig kit. Second generation equipment should bring down both costs and footprints. Note not all peering providers will have pricing as low as LONAP but they will almost certainly all be cheaper than transit. Also I only quote what HE pushed me. Experience tells that you can always get a better price by haggling – the internet market. Alright darlin’? Do you a fantastic price on 10Gig? !